In my last post, I wrote about a song, “In My Dreams”, that appeared, briefly, on the Hot 100 during early 1986 for a hair metal band named Dokken. Some of my readers definitely still remember, and appreciate, that song (even if American radio doesn’t). But were you Dokken aficionados aware that another group took a somewhat similar version of that same song not only into the Hot 100 but all the way into the Top 40? Show of hands: who remembers The Party? The Party (short for “Positive Attitude Reflecting Today’s Youth”) was one of the many dance-pop recording acts which appeared in that mini-golden age of dance-pop, 1989 to 1991, but, as far as I know, The Party was the only group (in that time period) composed entirely of cast members of The All New Mickey Mouse Club. * Formed by Disney and signed to Disney subsidiary Hollywood Records, The Party quickly released its debut and eponymous album, which spawned four singles, three of which hit the bottom half of Billboard’s Hot 100. While the group was working on a second album (Free), an EP titled In The Meantime, In Between Time, consisting of covers and remixes, was released in late 1991. As unlikely as it might have seemed at the time, or even now, one of those covers was Dokken’s “In My Dreams”. 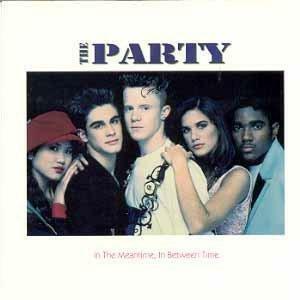 Obviously, The Party’s version has much more of the dance-pop sound that the group embraced; as shown below, that worked out fairly well for their version and propelled the EP onto Billboard’s albums chart. Unlike Dokken’s version, The Party managed to take “In My Dreams” right into the top 40. It entered the Hot 100 at #92 for the week ending November 16, 1991 (chart), the same week as the debut of another honoree of this site, Stacy Earl’s “Love Me All Up”. “In My Dreams” peaked ten weeks later at #34 (chart). It stayed in the top 40 for one more week, falling to #37 the next week before dropping out of the top 40. In all, the single spent a fairly respectable 18 weeks on the Hot 100. As it turned out, “In My Dreams” was the final single by The Party to reach the Hot 100. Free, released later in 1992, was not as successful as their first album, and after a last tour (opening for Color Me Badd), the group broke up in 1993. Since the disbanding of The Party, several of the group’s members had moderate success in acting or singing (arguably the most successful being Deedee Magno Hall, whose voice may presently be heard in the Cartoon Network series Steven Universe). In 2013, most of the group reunited and released a new album (one member, Tiffini Hale, has pretty much retired from public life). The Party maintains a Facebook page, albeit sporadically; as of this writing, that page includes a link to a band webpage that has expired. Like most early 90s dance-pop, The Party’s version of “In My Dreams” is quite difficult to find on any American terrestrial radio station. (As of this writing, it isn’t even available as an MP3 for sale at Amazon.) It would be nice to see this single, and the entire subgenre, make a reappearance on radio. * There were other cast members of The All New Mickey Mouse Club who also went on to have successful recording careers. You may very well have heard of some of them. Most of the other successful acts, though, entered the pop scene much later in the 1990s.